"I was looking for someone that would be upfront, concise, and honest. Ms. Hopkins had me hook, line, and sinker the moment we shook hands and she began to present Pine Bluff. Remarkable! Literally, there was no stone unturned. This area should have at least one more column above Excellent for those rare teams like Brittany and Ann. Wow! To be completely honest, every time I start to think about how enjoyable it was going through the process of purchasing our new home, I almost wish I could do it all over again. I never, at any time, felt pressured, lost, uninformed, or, remorseful. From the first moments of talking with Brittany to the last conversation we had, I felt as though I was in a college course for Realtor certification. Very refreshing to receive information that you want or need, when you want it. The best way to describe my experience is this: If I was the CEO of Meybohm Realtors and I went undercover as a home buyer and I went through the whole process with Ms. Brittany? Well, she would be the one that I gave $25k to continue education, pay for a week vacation for her and her family, and promote her to a Training Dept. responsible for developing training courses for other agents within the organization. It's how I feel." I absolutely love living here in Whispering Pines! The development and sales team works tirelessly to constantly keep homeowners in the loop and I always look forward to hearing and seeing how much this beautiful neighborhood has grown in just the 5 months that my family has been here. The amenities, including the two parks, walking trails and landscaping, are top-notch and there is even more to come! My family and I moved from out of state and I always am telling others that my favorite thing about living here in Evans is my phenomenal neighborhood and my amazing neighbors! My husband and I just recently moved to Whispering Pines after living in the area for over 10 years. It took us almost 3 years to settle on this neighborhood, because nothing around here beats the standard, and as soon as they started building this neighborhood we just KNEW we wanted to live here and raise our family here. With the sidewalks, NEW (and highly rated) elementary school walking distance, new park, and just breathtaking amenities all around, nothing is done half here. We love all the trees and green space throughout the neighborhood, and the location is PERFECT PERFECT PERFECT for our family. Just a few miles from our church and our gym (Evans Fitness), our family could not be happier with this neighborhood. Oconee Capital built our house, and they were AMAZING to work with. They literally built our dream home, and were there every step of the way. We really couldn't be happier. Brittany, and the whole Whispering Pines team were the nicest, most helpful people I have ever worked with. It really feels like home here. I can’t express enough how much I LOVE my new home and my new neighborhood! The park and walking trails are my favorite amenities so far, and there are more to come in the near future. The building process was fun and living in our dream home is even better! We LOVE living in Whispering Pines! We've been here just over a year and have really seen it blossom. Our builder (Oconee Capital) builds a top notch product and was always willing to work with us along the way as we made changes. After we closed, they continued to be receptive and helpful whenever we needed anything. We are hopeful there will be more neighbor-centric activities and events as the community continues to grow. A beautiful and fantastic neighborhood all around! Great Lots, fabulous builders and beautiful homes! "Beau Hopkins was very attentive and responsive to our needs and questions throughout the entire home buying process. He was readily available to assist us along the way. Being that he is very familiar with the local community, he was very helpful with linking us up to local contractors for granite, plumbing/appliances, cabinets, lighting, etc. Pleasant experience overall. We are extremely happy and satisfied with our new home. Local knowledge and relationships between the Agent, Builder, and Local Bank made everything a smooth process. Continue the outstanding support!!" "Brittany is a polished professional who strives to provide the best experience for buyers. She is knowledgeable, personable and a skilled negotiator. 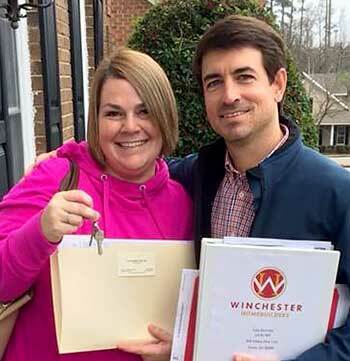 With her assistance, we were able to purchase our dream home." "We've moved quite a bit the last several years and we finally feel we're home! Everyone has been so welcoming, loving the "southern charm". The sales staff is outstanding. We feel fortunate to be a part of such a beautiful community." "When buying we were looking for a comfortable lot and somewhere that said community but privacy at the same time. The green space is wonderful. Hoping for a wonderful pool setup and great 3.5-acre park!